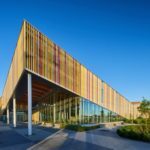 READ Rosemount encourages citizens to become engaged in the design and development processes of Ottawa’s New Central Library to be located at 555 Albert Street on LeBreton Flats. The civic engagement process for Ottawa’s new central library facility at 555 Albert Street has begun. The process is labeled “Inspire555 Series“. The first two engagement workshops are scheduled for: Thursday, February 28 in the Pellan Room of the Library and Archives Canada building 395 Wellington E. from 6-9 pm and Saturday, March 2 in Hall A of the Nepean Sportsplex from 9-12 pm. For more detailed information on the process Click here. Stay informed and have your say. 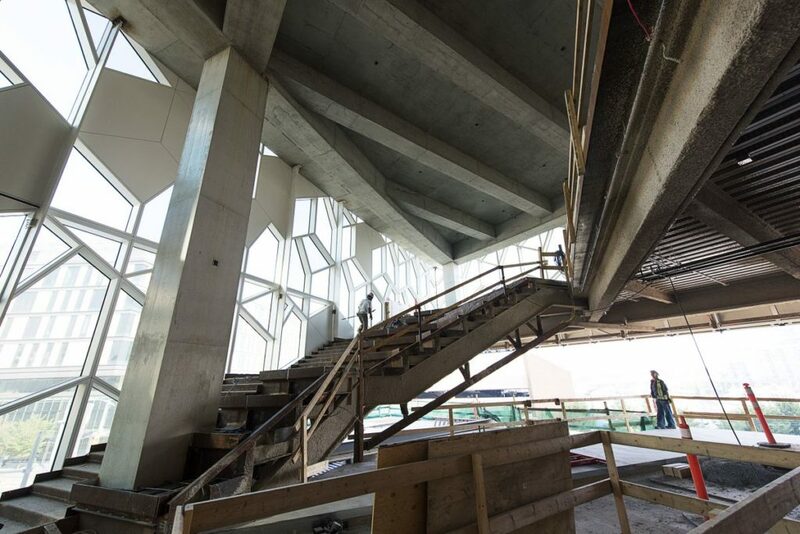 Bookmark the website dedicated to the new central library. Click here. 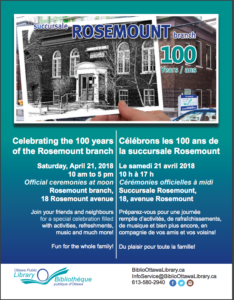 ALERT: Rosemount Revitalization Open House-Round Two! Saturday, December 15, 2018; Noon to 2 pm. 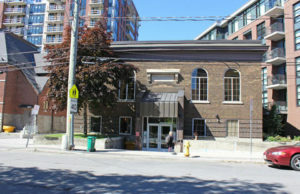 Come by the branch, meet your neighbours, hear the architects and share your ideas about what Rosemount branch can be. 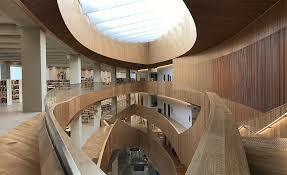 From Snøhetta’s new $245 million Central Library in Calgary, Alberta to Berlin’s “eco-intelligent” Philological Library. Some inspiration for Ottawa. By Norman Fisher. Click for full article from Architectural Digest. 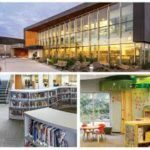 While we are all waiting for our revitalized Rosemount Branch and Ottawa’s new central library to take shape, let’s have a look at (and celebrate!) 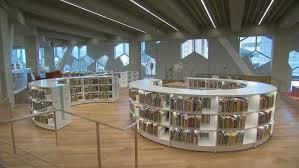 the new central library in Calgary which opened Nov 1, 2018. 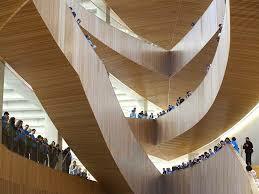 It was designed by Snøhetta, a Norwegian firm in partnership with the Canadian firm Dialog. Snøhetta also designed the Isabel Bader Performing Arts Centre (opened 2014) in Kingston (ON), the Norwegian Opera and Ballet Centre in Oslo (opened 2008) and the Olso Deichmanske Central Library scheduled to open in 2020. 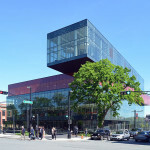 Have a look at Canada’s newest central library! 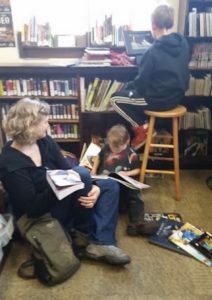 On October 3, the Ottawa Public Library hosted a very well attended open house regarding the revitalization of the Rosemount library-a branch the Ottawa Public Library located in a 100 year old building. 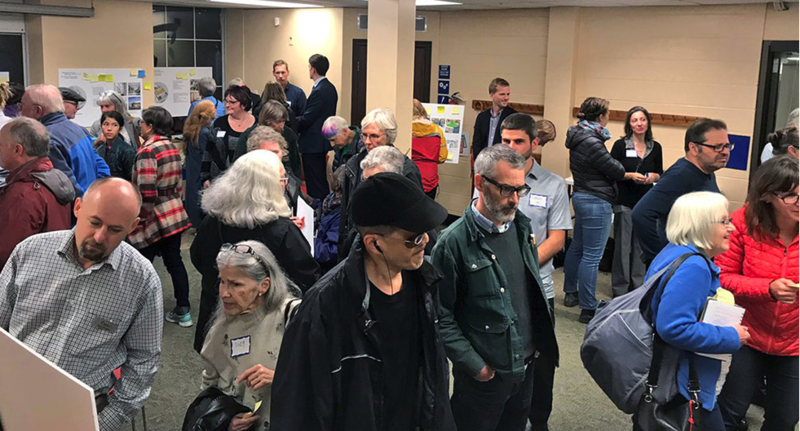 The small lower-level meeting/program space at Rosemount was packed as members of the community circulated to examine design ideas for the future Rosemount. Attendees shared their own ideas and feedback by writing on Post-It notes and attaching them to various poster-boards created by +VG Architects – the project architects. 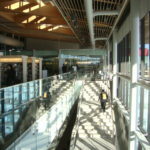 One particular design element that seemed to be the subject of criticism was the OPL’s focus on outdoor space. Many open house attendees expressed concerns that outdoor space would have limited use given Ottawa’s climate. 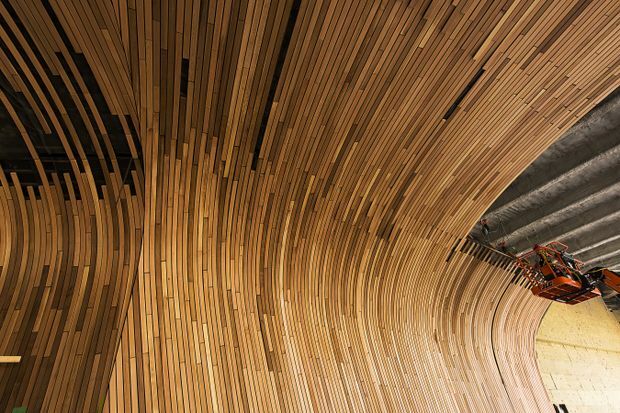 In READ’s view, the focus should be on expanding and improving the indoor space. The ongoing community consultations allow residents to give feedback on all aspects of the proposed renovation. READ believes that the Rosemount branch must meet the demands of the diverse and growing Kitchissippi neighbourhood. 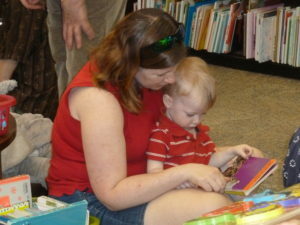 The library should be re-designed so it becomes an innovative, interactive, and integrated community hub. 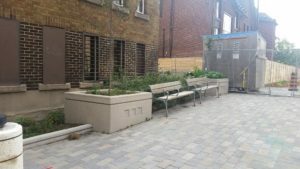 READ also encourages people to consider what design features would allow Rosemount to serve the high-needs and vulnerable groups and individuals in the community. 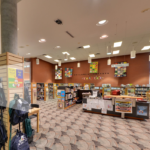 The Ottawa Public Library is still seeking feedback through an online survey. As well as the survey, the display boards and photos used at the Open House are also on the OPL website at biblioottawalibrary.ca/en/rosemount-revitalization-presentation. A second consultation in December will present a preliminary design based on the input received from the community. 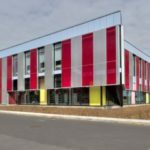 READ is asking that the format for this December consultation feature a presentation by the architects, followed by a question and answer session. It is important that there be a dialogue so all attendees can hear each other’s viewpoints. National Post, October 18, 2018. Sadaf Ahsan. 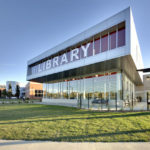 Sadaf Ahsan: Unlike so many industries that have been disrupted by technological advances, libraries across North America have shown an uncanny ability to adapt. For full article click below. 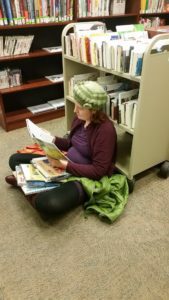 This summer, Forbes magazine published an article arguing that libraries no longer served a purpose and did not deserve public support. 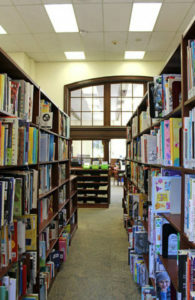 The author, an economist, suggested that Amazon replace libraries with its own retail outlets, and claimed that most Americans would prefer a free-market option. 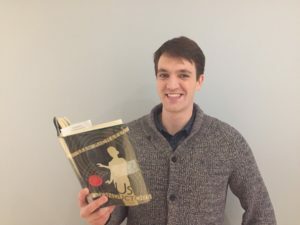 The public response — from librarians especially, but also public officials and ordinary citizens — was so overwhelmingly negative that Forbes deleted the article from its website. 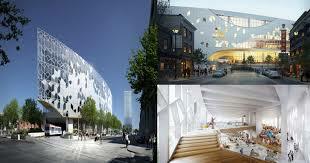 The winner will go on to design the new central library/Library and Archives Canada joint facility. Ottawa is one step closer to getting a new main branch. 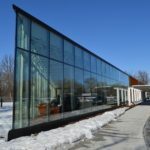 The five teams were selected out of 33 submissions received by the City since May 2017 and all have experience with projects of similar size and scope including libraries, archives, performing arts centres or museums, according to a news release. The five teams are: Bing Thom Architects & GRC Architects; Diamond Schmitt & KWC Architects; Mecanoo International & NORR Architects & Engineers Ltd; Patkau Architects, MSDL Architects & GRC Architects; and Schmidt/hammer/lassen, KPMB Architects & Hobin Architecture Inc.
On Saturday, April 21, 2018, The Ottawa Public Library will mark 100 years of the Rosemount Library branch being located in a Carnegie building at 18 Rosemount Ave in Hintonburg. 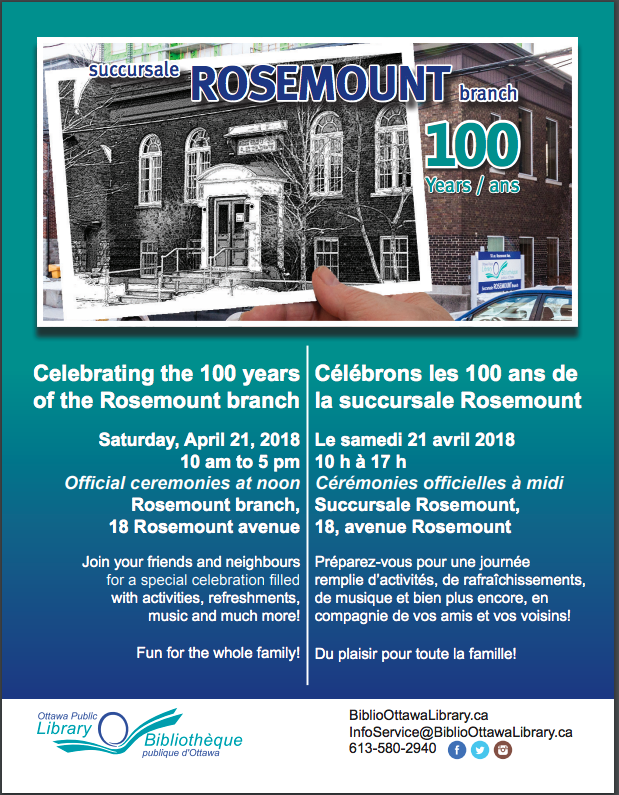 Join your friends and neighbours for the official ceremony at 12 Noon at the branch. Special kids’ activities throughout the day. 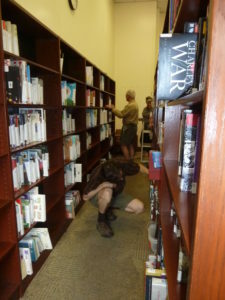 For the Rosemount story click here for Dave Allston’s “The History of the Rosemount Library: Endless Growth“. P.S. Let’s get as many library supporters as possible out to see how many people fit in our little library! 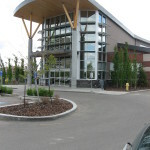 READ Rosemount has said many times that Rosemount is a very busy branch. We’ve said many times that Rosemount is over crowded. And we’ve said many times that due to its size, Rosemount cannot provide the same great services available in other comparable OPL branches. 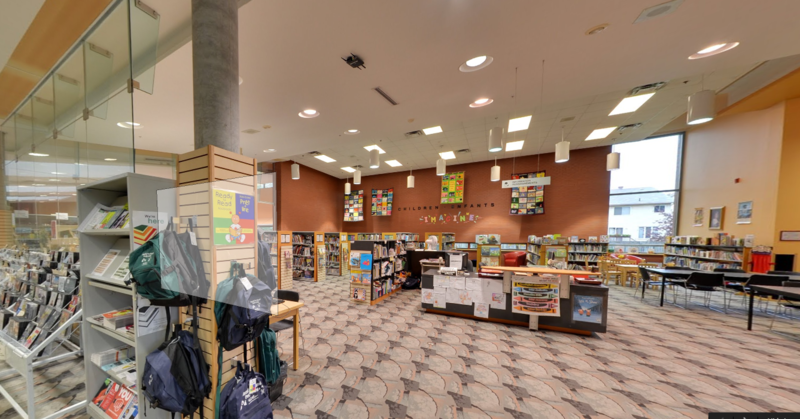 Our volunteers have worked tirelessly to document the case for an expanded Rosemount branch primarily using the OPL’s own data. Now that data is available in a convenient and easy to read document. 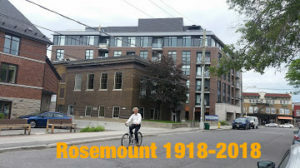 Click here for Resources where you will find Rosemount Comparative Stats.